From San Sebastian, we headed to Pamplona for the last two days of San Fermin; a week long event that is known for its running of the bulls. 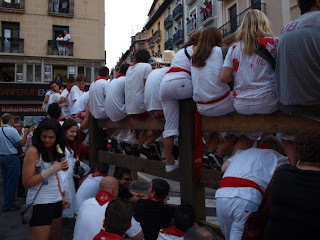 The streets of Pamplona are stuffed with pedestrians wearing red and white; a level of participation that would make even the Calgary Stampede look lame. Kids, geriatrics, dogs - everyone wears red and white. 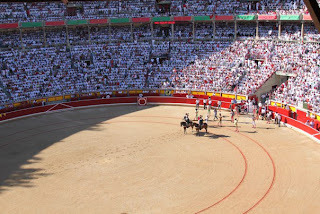 We managed to pick up some tickets to the last bull fight of the week from a scalper outside of the stadium. While the event is typically marked by a high level of etiquette, on the last day it is a complete free for all (don't bring your designer clothes!). The sangria was being consumed in unimaginable quantities. 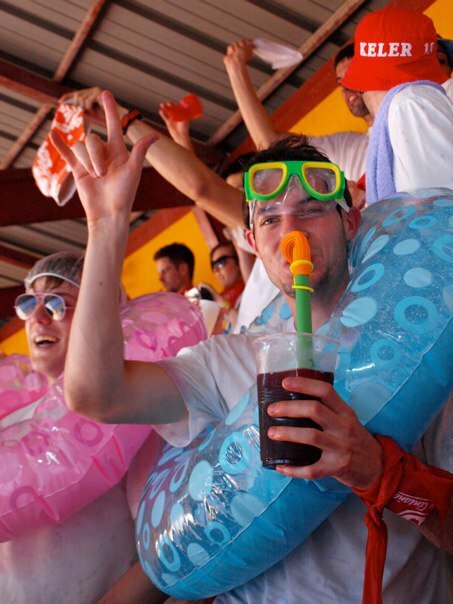 To offer some perspective, this was our neighbour, drinking his out of a snorkel. But that was just the beginning. These same guys had pump action waterguns filled with sangria; we were sitting for all of 15 minutes before a civil war broke loose and we were soaked. At some point, someone brought out a few tupperware containers of seafood. 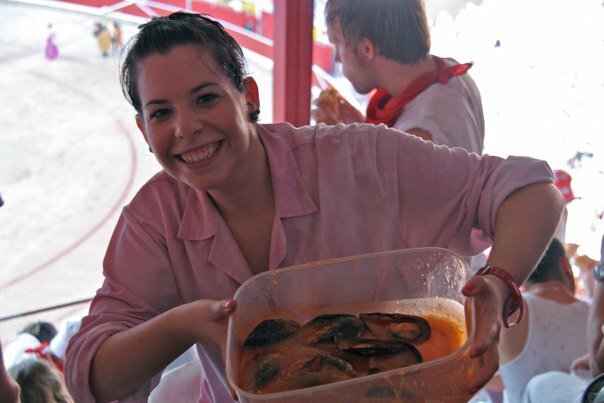 Who brings seafood to a sporting event? When it is 40 degrees out? I've seen the old octopus on the ice trick at the hockey game, but this is a whole new level of disgustingness. Disgustingness, and hilarity. 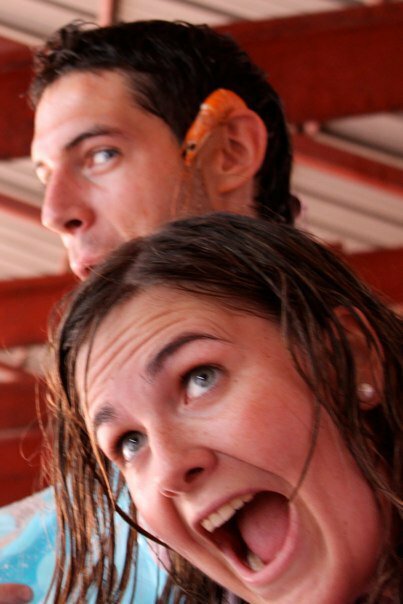 Yes, that's a shrimp behind his ear. Lest I leave the impression that that was the only action taking place in the forum. 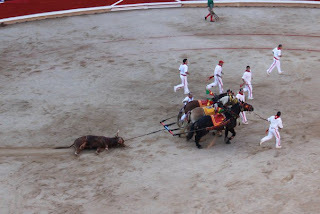 Below, the matadors took on about six different bulls. 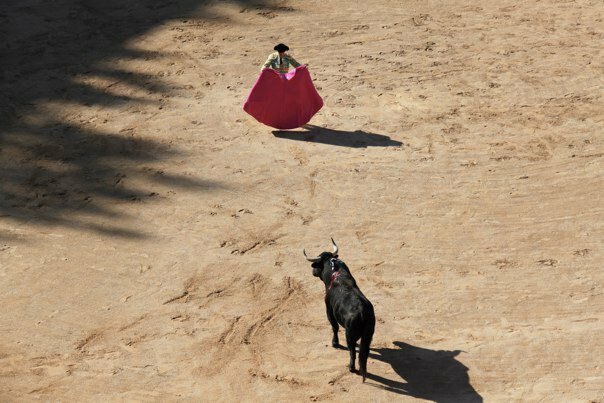 An interesting sight to see, for the sake of understanding what actually happens at a bull fight, but something that I don't need to do again. For all of the grace and beauty that defines the start of a 'fight', there's nothing graceful or beautiful about how it ends. It's shameful to take away an animals dignity in this way and shocking that this still takes place with such regularity in the modern world. And when the fight was over, we headed out on the town. 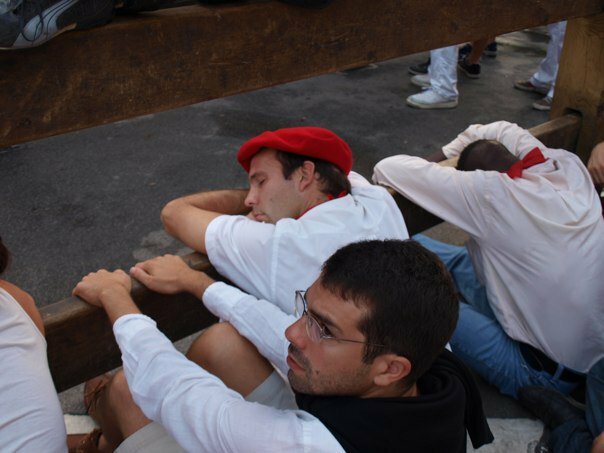 In keeping with tradition, we celebrated all night, until the running of the bulls in the morning. Getting a good spot to watch means waiting a while before the running starts. Because, eventually, all points of visibility become blocked with other spectators. Until, for a brief few minutes, we watch a crowd of totally insane people dodge bulls. 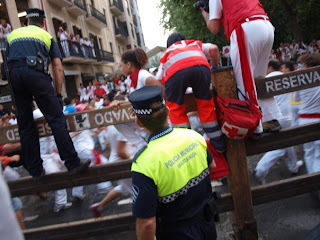 For all of the attention that this event gets on global television, the mayhem lasts a fleeting few minutes and comprises only a fraction of the excitement of San Fermin. Can one be fulfilled in life without seafood being a wardrobe accessory at least once? In fact, I'm fairly certain one can. But, out of curiosity, what other ways are there to use seafood as an accessory?